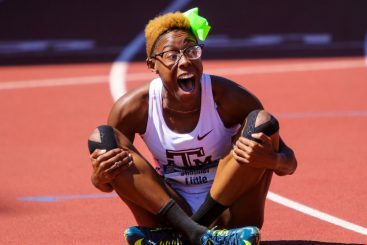 Texas A&M track coach Pat Henry thinks that Oregon has an unfair advantage at the NCAA Track & Field Championships, according to a Saturday article by Oregonlive’s Andrew Greif. Henry, it seems, thinks that the home field advantage works to Oregon’s favor — and he’s right. But Henry misses the boat when he jumps from “advantage” to “unfair advantage.” Oregon’s advantage in track & field is the subject of this week’s Three-and-Out. 1. Yes, Oregon does have an advantage. 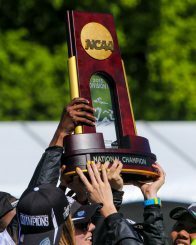 There are reasons why the NCAA has committed to holding the Division I track & field championships at Historic Hayward Field through the year 2021. Shamier Little missed Henry’s memo and forgot the whine after posting one of the top times in the world in the 400 hurdles. Simply stated, there is no other place in the United States that holds a candle to Hayward. The weather in June tends to be perfect (vs. sweltering or flooded in much of the rest of the country, including a good portion of Texas). The turnout of fans dwarfs any other possible venue. The fans are knowledgeable, and while they support the Ducks with the most vigor, they applaud all efforts. Good sportsmanship abounds. The advantage that Oregon has in meets at Hayward is not the sort of home field advantage you see in football, or home court advantage in basketball. Truly, it is an advantage for all of the athletes to compete at Hayward instead of a lesser venue. It just happens to be a bit more of an advantage for the home crowd favorite Ducks. 2. There is absolutely nothing unfair about the advantage. Saying that Oregon’s advantage at Hayward is unfair is like saying it’s unfair that Jenna Prandini is faster than I am. The truth is, I’m 67 years old and am not overly endowed with fast-twitch muscles. Prandini is more or less 21 years old and has more fast twitch muscles in her little fingers than I have in my body. Prandini leans to victory in the 100 meters. Prandini has natural ability and she has worked for everything she has accomplished. With a moderate climate and low humidity, Eugene has the natural ability to host a top level track meet in its agreeable climate — something that I doubt exists anywhere in Texas this time of year. If anything is unfair, it’s that the NCAA sends athletes to that hellacious climate for the preliminary rounds this time of year. But it’s not just the natural ability. The University of Oregon — and the citizens of Eugene — have worked hard for many, many years to develop the facilities and track culture that elevate it head and shoulders over anything else the country has to offer. Eugene and Hayward have the natural ability, and they have worked their tails off to develop it. There’s nothing unfair about it. Sorry, Pat Henry, but it’s sort of the American way that the combination of natural ability and hard work provides rewards. 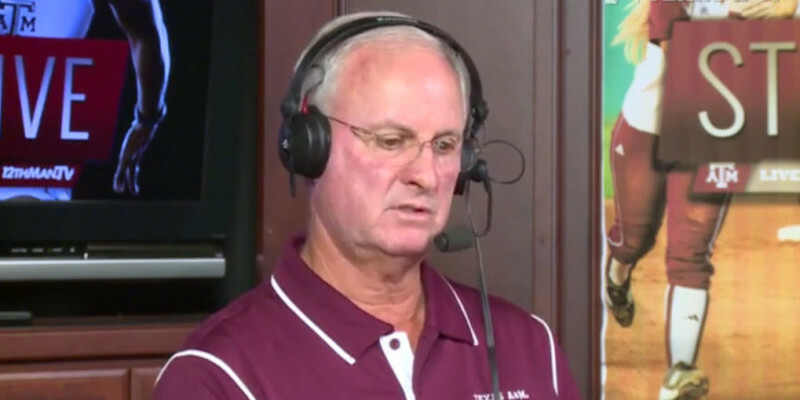 Henry might as well complain that the NCAA doesn’t hold its downhill ski championships in Texas. You may say that it’s an unfair comparison because Texas doesn’t have the climate and facilities for it. But, too bad for the state of Texas, it doesn’t have suitable climate and facilities for a competitive track championship, either, so Henry should just stop his whining and deal with it. His athletes certainly didn’t seem to mind competing in the sweetest environment in the country. The solution. It is just too bad that Historic Hayward Field stands alone as the top track & field venue in the United States. The last I knew, though, the United States is a free country. There is no law that forbids other schools and cities from establishing equal or better venues. They just haven’t gone to the trouble — or they don’t have the natural ability to start with. The Oregon men, Oregon women and Historic Hayward Field are all champions. That is not the fault of the University of Oregon. It’s the responsibility of Henry — and any others who don’t like the present arrangement — to present suitable alternatives. And they haven’t done it. When they turn around and cry “foul,” they only make themselves out to be crybabies. I can understand Henry’s fear. 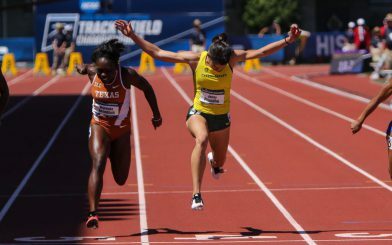 ESPN’s coverage of the 2015 Championships served as an effective advertisement for the University of Oregon Track & Field Program. Any high school trackster watching it would have to dream of donning green and yellow with an “O” on the shirt for that meet. The real danger for Henry is that by the time 2021 rolls around, the Oregon track program will be solidly in dynasty mode. If Henry — or anybody else — wants to do anything about it, their interests will be better served by developing equal support for their own programs rather than crying about how unfair it is that Oregon has left them in the dust where overall track culture is concerned. But they had better hurry, because they are shooting at a moving target. With a major facilities upgrade on the way to host the World Championships in 2019 — for the first time in the U.S. — the Ducks are not waiting around for them to try to get back in the race.